A hands-on retreat for grades 9th-12th. Registration is 7:00 pm January 11, 2019 in the main Lodge building. Cost to attend is $150 per high school student. Payment via credit card available below. You may also select "pay at event" and bring cash or a check made out to Solomon Episcopal Conference Center (SECC). Scholarships available by contacting Mother Jane-Allison Wiggin-Nettles at jwigginnettles@edola.org or by calling or texting 504-295-1375. 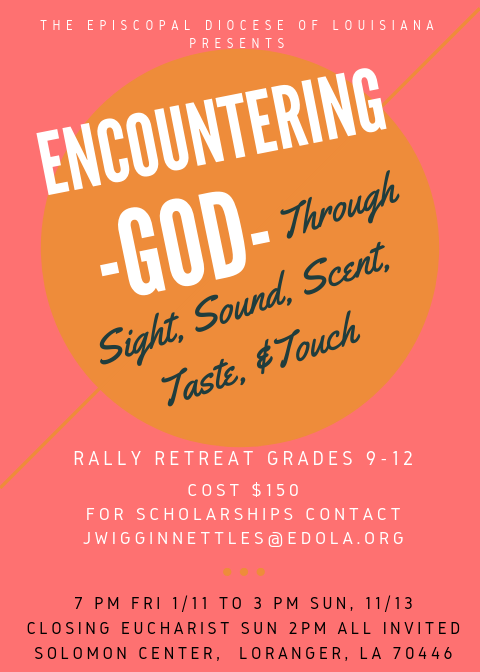 Senior High Rally is open to all youth in 9th, 10th, 11th and 12th grade in the Episcopal Diocese of Louisiana and friends from any religious backgrounds. This is a Christian retreat that is open and welcoming to all.